Sugar intake has become a major concern in the United States, with studies linking high sugar consumption in childhood to development of heart disease risk factors, including obesity, high blood pressure and related diseases. Children with high daily calories from added sugar, tend to eat fewer fruits, vegetables, whole grains and low-fat dairy products that are good for their heart health. According to the Centers for Disease Control and Prevention (CDC), boys in the U.S. aged 2-19 years consumed around 16.3 percent of their daily calories (around 362 calories) from added sugars, while added sugars accounted for around 15.5 percent of daily calories (around 282 calories) for girls of the same age. In an attempt to help tackle the problem, the American Heart Association (AHA) has issued new guidelines for added sugar intake among children and adolescents. The AHA says their new statement - recently published in the journal Circulation - is easier to follow. 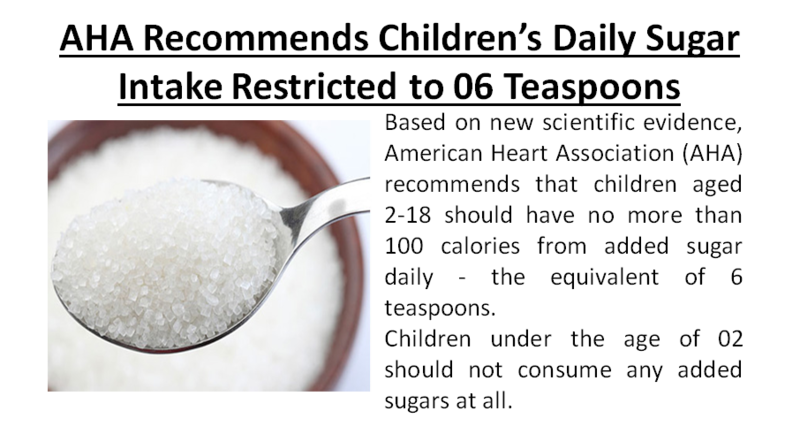 To keep it simple for parents and public health advocates, all children between the ages of 2 and 18, to restrict eating added sugars to no more than 6 teaspoons per day. As taste preferences develop early in life, limiting intake of added sugars before the age of 2 may reduce preference for unhealthy foods later on. From July 2018, food manufacturers in the U.S. will be required to list added sugar content on their labels, which will make these new AHA guidelines easier to adhere to. Until then, the authors feel that the best way to avoid added sugars in your child's diet is to serve mostly foods that are high in nutrition, such as fruits, vegetables, whole grains, low-fat dairy products, lean meat, poultry and fish, and to limit foods with little nutritional value.